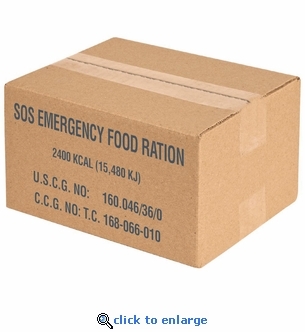 1 Case of 40 SOS 2400 Calorie Emergency Food Bars. Each of the 40 vacuum sealed packages contains 6 individually wrapped 400 calorie bars ready to eat. Each emergency food bar provides 3 days of survival food in an emergency. Our SOS food bars are economical and made with quality natural ingredients. When faced with a survival situation, a supply of emergency food bars will keep you strong and motivated. Flavor: Slight coconut with shortbread cookie taste. Ready to Eat: 6 pre-measured 400 calorie meals in each package. FDA Compliant G.R.A.S (Generally Recognized As Safe) Emergency Food. Manufactured in a Peanut, Shellfish and Sesame FREE Facility. Stored temperature of -22° F to 149° F.
Food bars are baked: Healthier and taste better than compressed, uncooked bars. Ingredients are compatible with drinking water restrictions and are non gas-forming.